A product of Buffalo’s West Side, John Bellanti fell in love with basketball at an early age. John overcame a serious childhood illness to make the Grover Cleveland High starting five as a 5-7 playmaking guard. After four years at Canisius College, Bellanti yearned for a way to stay active in the game; he found the way in a whistle. In all sports, officials are usually nameless, faceless backdrops to the actions of the players and most officials will confide that the most effective performance of their duties entails such anonymous unobtrusiveness. However, Bellanti has proven the exception to this rule. 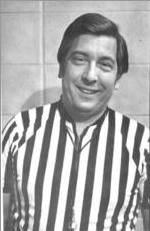 A 5-7 giant among referees, John has inevitably made a name for himself in his craft and created a matchless 30-year career in stripes on the hardwood. On the high school level, Bellanti officiated over 1,500 high school games between 1955 and 1985 including 17 Manhattan Cup Finals, eight Yale Cup Finals, 16 Section VI Championships, and 6 Supersectional Championships. His resume on the college level is equally impressive: Division I-III games in six different collegiate conferences; 55 NCAA Tournament games, three National Invitational Tournaments at Madison Square Gardens, 14 Kodak Classics in Rochester, 10 Carrier Classics in Syracuse, eight Queen City Tournaments in Buffalo, and eight ECAC Tournaments. Bellanti is one of only two referees from Buffalo to referee in both the NCAA tournament and National Invitational Tournament, a remarkable distinction for a native of a city which during his heyday was a basketball hotbed. John has carried his passion for basketball beyond the confines of the court as a member of the International Association of Approved Basketball Officials (IAABO). Bellanti was the first Buffalonian ever elected President of the IAABO (1978-79), and was also elected a Life Member of IAABO (1980). Perhaps John’s greatest contribution to the organization, and to the sport of basketball, was his role in creating the first IAABO Referee Training School at four sites in the U.S. and Canada. The program, still operational today, is the premier training course for referees in the United States. Bellanti’s contributions to the Buffalo Sports scene are not limited to basketball. John introduced professional indoor soccer to the area in 1979 as vice president and director of the Buffalo Stallions, and he currently serves as president and CEO of the Buffalo Blizzard. However, it has ultimately been a fondness of bouncing spheres which has landed John Bellanti in the Greater Buffalo Sports Hall of Fame.